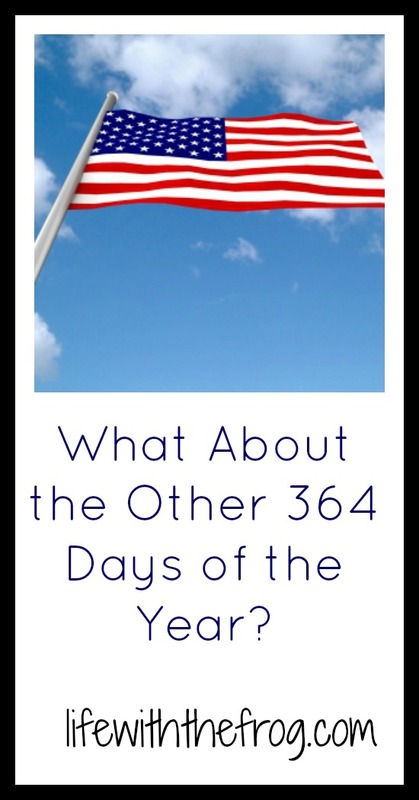 kissing the frog: What About the Other 364 Days of the Year? There is no denying that September 11 is an extremely emotional day for our country. It is doubtful there is an adult alive who doesn't remember exactly where they were when they heard the news of the senseless terror attacks. And those who were there, remember it with haunting clarity. 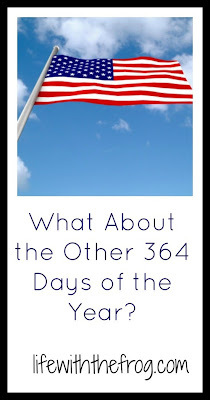 Every year, though, as I watch the memorial ceremonies and hear the names of the dead read aloud, see firefighters interviewed on television, and watch people hug and cry, I have to wonder, What about the other 364 days of the year? Please don't misunderstand me, I cry every year and remember with sadness and a heavy heart. I have stood and looked down at the gaping hole where the towers once stood as bile rose in my throat at the thought of what the victims went through. But why are we only sweet, kind, and understanding to one another on one day? Yes, September 11th is a day that weighs on the collective conscience of the nation, but why is it so hard to understand that these families and friends are grieving on the other 364 days, too? I get so sad and uncomfortable when I see and hear of people being rude, mean, and dismissive to one another. We've all seen the Internet comments full of bitterness and vitriol splashed around as carelessly as a drunk girl's vodka and diet Coke at the bar. We pass by those who need help, disregard their pain over personal tragedy, and tell them to "get over themselves." But when an anniversary of a collective tragedy comes round, we're all holding hands in a circle singing Kumbaya. Laughing, crying, praying, singing, sleeping - things we each do every day. Every day each one of us carries some kind of pain with us. A pain that could be lessened by another person's love and understanding. I'm not suggesting that we halt all ceremonies for victims of mass tragedy. I think it's a necessary part of healing; just as we have a Joey party every year on his crapiversary, people need to grieve in order to heal, reflect in order to learn, look back in order to move ahead. My heart goes out to all the people who are remembering today as though it were yesterday. To all those mourning loved ones - spouses, friends, children, parents, siblings - I feel your pain, I know the shock of sudden tragedy. To everyone else, please remember that pain is not over tomorrow. For anyone grieving anything, their pain in not confined to one day a year. Perhaps if we stop being so pop-culture obsessed, so egocentrically in to behaving however we want, and spewing whatever hate comes out of our mouths, we can realize that on the other 364 days a year, we're not so different from each other after all.